Surprises come in all shapes and sizes. Some scare the wits out of us while others are so thoughtful and kind they simply take our breath away. Such is the case with clip above, where a woman pulls into her driveway to find the Corvette of her dreams. Once the video rolls the husband opens the garage as his wife, who’s chatting on her phone, pulls into the driveway. She sputters a few words about phoning the caller back and then the moment fully sinks in– the bright blue Corvette C3 sitting in the garage is all hers. She covers her mouth in disbelief and the tears begin to flow as she hugs her husband and sits in her brand new car for the very first time. She glances around the interior but still can’t help sobbing with disbelief. Seriously, who wouldn’t? 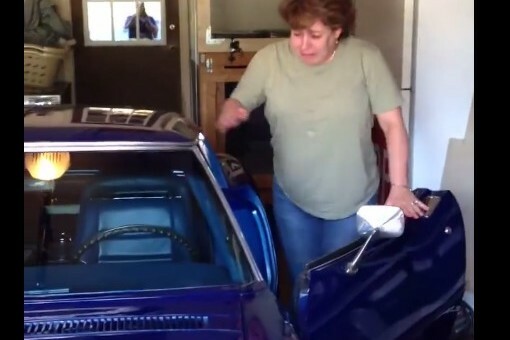 It’s a truly touching moment and we hope the woman has the chance to enjoy her chrome-bumper C3 before the summer ends. Watch the whole moment unfold here.